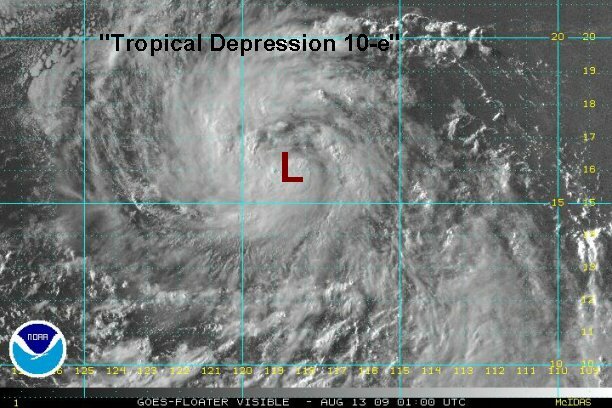 Tropical depression 10-e will likely be classified at the 8 am pdt advisory time. Deep convection is expanding and organizing. The mid level and surface spin appear to be separted at this time. As of 8:30 am edt / 5:30 am pdt the "tropical disturbance" was centered near 15.3° N / 115.5° or about 630 miles southwest of Cabo San Lucas, Mexico. Top sustained winds are estimated at 35 mph. It is moving west at about 13 mph. Tropical depression 10-e will likely be classified as tropical storm Guillermo on the 2 pm pdt advisory time. Convection continues to build and banding is looking impressive on the northwest side of the circulation. As of 3:00 pm edt / 12:00 pm pdt the "tropical depression" was centered near 15.8° N / 116.9° or about 660 miles southwest of Cabo San Lucas, Mexico. Top sustained winds are estimated at 45 mph and increasing quickly. It is moving west northwest at about 13 mph. 2 pm pdt discussion from NHC said they wanted to but didn't upgrade to tropical storm strength. Tropical depression 10-e should be classified as tropical storm Guillermo on the 8 pm pdt advisory time. Convection and banding look excellent. As of 10:00 pm edt / 7:00 pm pdt the "tropical depression" was centered near 16.0° N / 118.8° or about 740 miles southwest of Cabo San Lucas, Mexico. Top sustained winds are estimated at 50 mph and increasing. It is moving west northwest at about 13 mph. Guillermo has been on a path of strengthening and organizing overnight. It is becoming a more compact system which should help development. 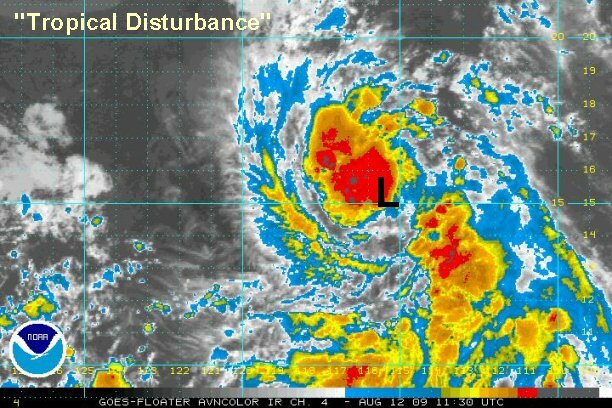 Deep convection is growing near the center of circulation. Guillermo should have favorable conditions for further strengthening. As of 7:00 am edt / 4:00 am pdt tropical storm Guillermo was centered near 17.1° N / 121.0° or about 815 miles southwest of Cabo San Lucas, Mexico. Top sustained winds are estimated at 55 mph and steadily increasing. It is moving northwest at about 16 mph. 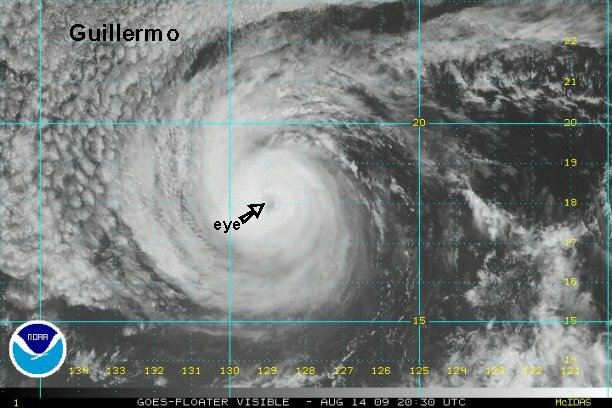 Guillermo has steadily organized today with an eyewall starting to take shape. We expect Guillermo to reach hurricane strength in the next few hours. Conditions remain favorable for further strengthening. As of 3:00 pm edt / 12:00 pm pdt tropical storm Guillermo was centered near 17.1° N / 122.5° or about 900 miles southwest of Cabo San Lucas, Mexico. Top sustained winds are estimated at 70 mph and still increasing. It is moving just north of due west at about 16 mph. Guillermo is now displaying an almost solid eyewall with very deep convection on the west side of the circulation. Conditions favor additional strengthening. As of 8:00 pm edt / 5:00 pm pdt tropical storm Guillermo was centered near 17.2° N / 124.0° or about 985 miles west southwest of Cabo San Lucas, Mexico. Top sustained winds are estimated at 80 mph and still increasing. It is moving just north of due west at about 15 mph. 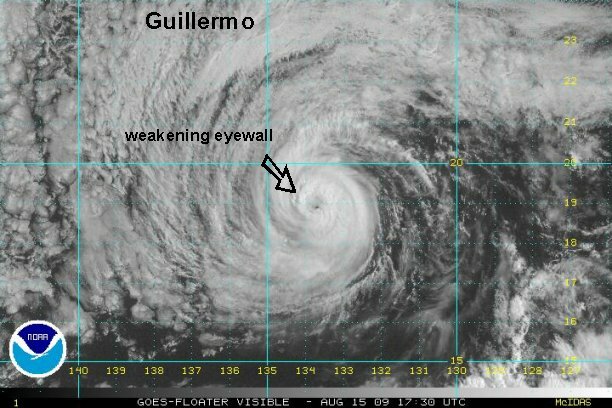 The southern eyewall of Guillermo is still in excellent shape. This is where the strongest winds are located. The northern eyewall is deteriorating. If this continues, guillermo will weaken to a tropical storm. As of 8:00 am edt / 5:00 am pdt tropical storm Guillermo was centered near 17.9° N / 126.5° or about 1120 miles west southwest of Cabo San Lucas, Mexico. Top sustained winds are estimated at 75 mph. It is moving west northwest at about 15 mph. 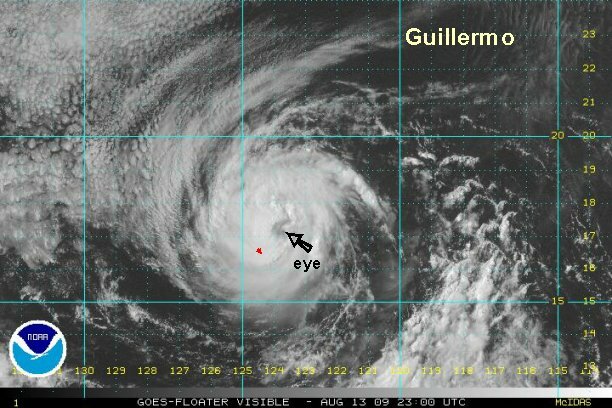 After a short brake in development this morning, Guillermo has gone though a strengthening phase with the eye appearing again over the past several hours. The eyewall to the west continues to cool. Some additonal strengthening is possible. As of 5:00 pm edt / 2 pm pdt hurricane Guillermo was centered near 18.0° N / 129.0° or about 1275 miles west southwest of Cabo San Lucas, Mexico. 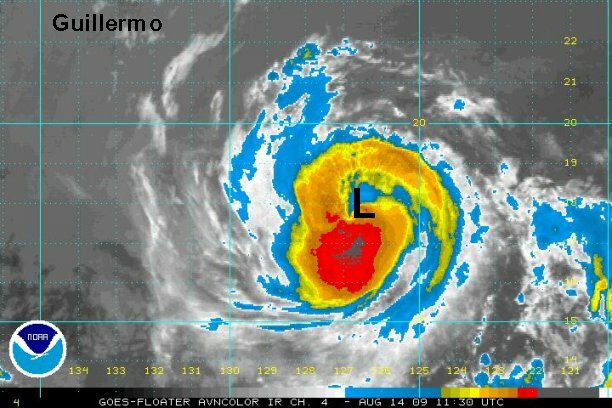 Top sustained winds are estimated at 100 mph. It is moving west at about 15 mph. I.R. satellite imagery shows that Hurricane Guillermo has changed little since this evening. The eyewall still has deep convection, which has actually expanded and now has become more symmetrical. The cloud tops have warmed a touch though. Basically, Guillermo has no changed strength much. It is NOT a threat to Mexico. Guilllermo's strengthen trend is about over. 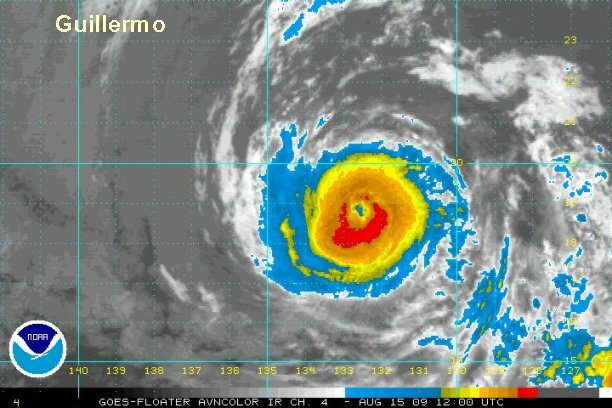 Cooler sea surface temperatures are directly in the pathway and will soon rob Guillermo of it's needed power supply. Look for the hurricane to quickly weaken inthe next 24-36 hours. As of 8:30 am edt / 5:30 am pdt hurricane Guillermo was centered near 19.0° N / 132.8° or about 1490 miles west of southwest Cabo San Lucas, Mexico. Top sustained winds are estimated at 115 mph. It is moving northwest at about 16 mph. Forecast models keep Guillermo northwest of the Hawaiian Islands. NHC had Guillermo up to 125 on their last advisory. Weakening has taken shape since then. Cloud tops are warming especially to the west. We expect Guillermo to steady go downhill now as it heads over cooler water. 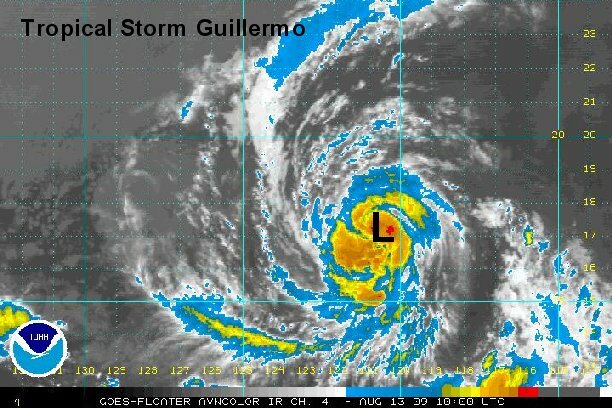 As of 2:30 pm edt / 11:30 am pdt hurricane Guillermo was centered near 19.0° N / 133.8° or about 1555 miles west of southwest Cabo San Lucas, Mexico. Top sustained winds are estimated at 110 mph and decreasing. It is moving northwest at about 16 mph. After significant weakening earlier in the day, Guillermo has steadied and is weakening only slowly now. 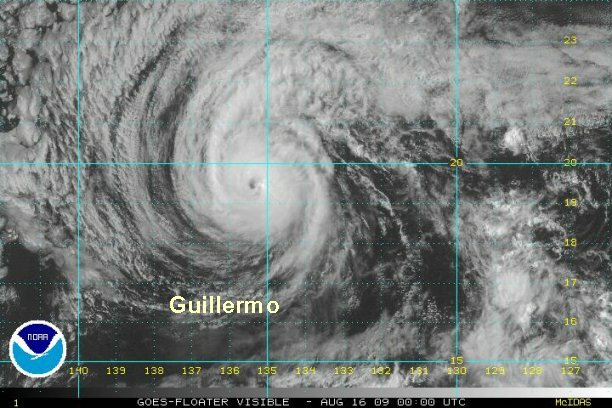 As of 8:30 pm edt / 5:30 pm pdt hurricane Guillermo was centered near 19.6° N / 135.4° or about 1650 miles west of southwest Cabo San Lucas, Mexico. 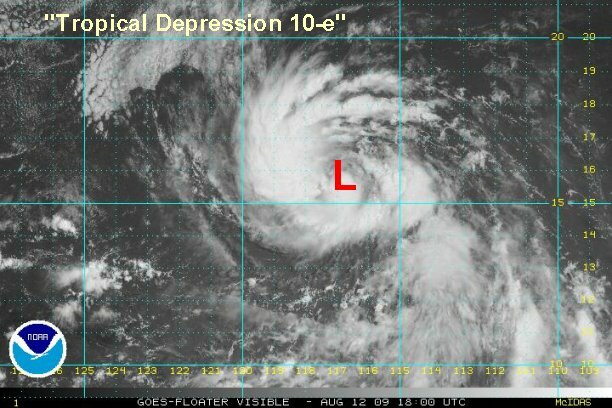 Top sustained winds are estimated at 105 mph. It is moving northwest at about 16 mph. 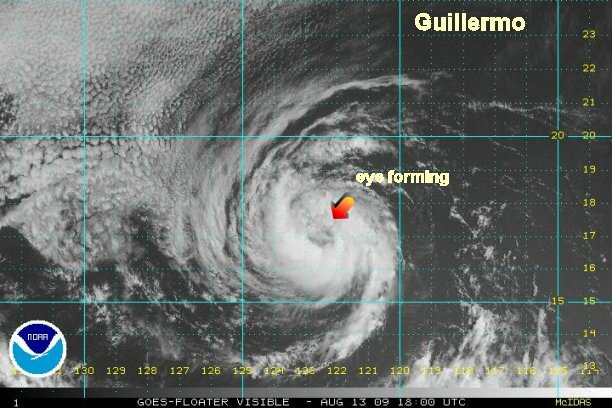 Guillermo has had little change over the past several hours except for a gradual west turn. 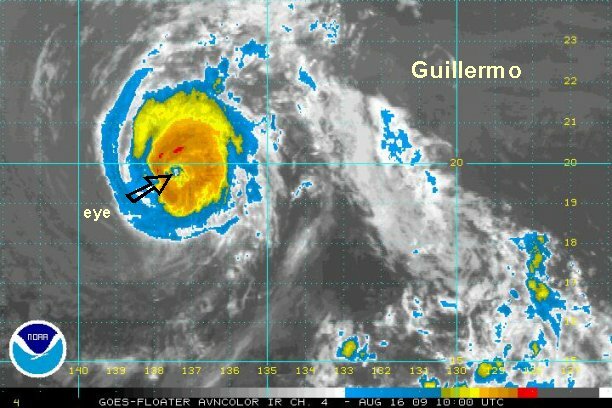 As of 6:30 am edt / 3:30 am pdt / 12:30 am hst hurricane Guillermo was centered near 19.8° N / 137.5° or about 1150 miles east of Hilo, Hawaii. Top sustained winds are estimated at 100 mph. It is moving west at about 15 mph.